Search Minerals Discovers Henley Ha… | Search Minerals Inc.
VANCOUVER, March 13, 2015 /CNW/ - Search Minerals Inc. (“Search” or the “Company”) (TSXV: SMY), and its wholly-owned subsidiary, Alterra Resources Inc. (“Alterra”), are pleased to announce the discovery of three belts of “critical rare earth element” (CRITICAL REE) mineralization in the Henley Harbour area of SE Labrador: Bad Bay - Iceberg, St. Peter’s Bay and Pleasure Pond. Channel and grab samples from showings in these belts reveal high concentrations of REE, Nb, Zr and Y from the Bad Bay-Iceberg belt, and high concentrations of Zr, Nb, and HREE, including Dy and Y, from St. Peter’s Bay and Pleasure Pond belts. Each belt exhibits characteristics similar to the HighREE Hills and Ocean View belts found 30 - 40 km to the north in the Port Hope Simpson CRITICAL REE District. 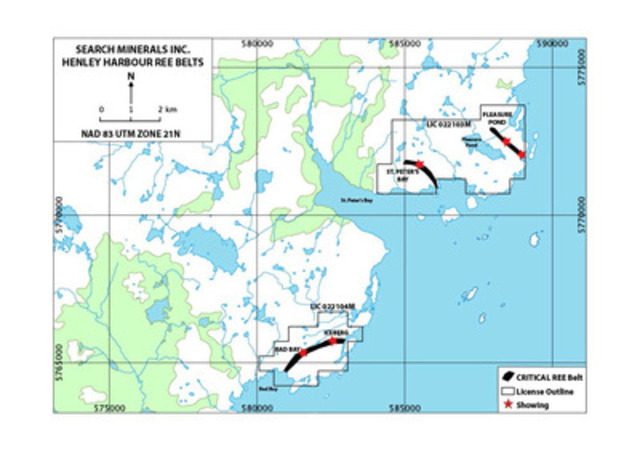 Three new belts containing Critical REE mineralization have been discovered in the Henley Harbour CRITICAL REE District, SE Labrador (see Figure 1): Bad Bay – Iceberg (2.25 km long), St. Peter’s Bay (< 1 km long) and Pleasure Pond (1.5 km long) belts. The Henley Harbour area is located 25-30 km southeast of Mary’s Harbour and 30 - 40 km south of St. Lewis and is accessible by air and boat. The three new belts are within 0.5 km of tidewater and occur from 18 - 25 km east of the Trans-Labrador Highway; the FOXTROT PROJECT is located 33 – 40 km to the north. 3) Pleasure Pond (see Table 3) reveals Dy values up to 3400 ppm (Dy203 up to 4500 ppm); HREE+Y/Total REE+Y ranges up to 65.07%; Nb values range up to 14407 ppm, and Y values range up to 14700 ppm. Analytical techniques, sample preparation and channel sampling procedures are outlined in Search’s July 27, 2010 and September 8, 2010 news releases. A small exploration program is planned in 2015 to further evaluate these REE mineralized belts. Search is the discoverer of the Port Hope Simpson CRITICAL REE District, a highly prospective CRITICAL REE belt located in southeast Labrador, where the Company controls a belt 70 km long and up to 8 km wide. Search owns 100% of the advanced CRITICAL REE resource called the Foxtrot Project (FOXTROT), and a recently announced Foxtrot-like prospect called “Deepwater Fox”. In addition, the Company has identified more than 20 other Foxtrot-like prospects in the District. The primary focus of Search is to continue to advance the Foxtrot resource, while evaluating other Foxtrot-like prospects. Several of the Foxtrot-like prospects require exploration drilling programs and may provide additional resources to a central processing facility that would be situated within the District. The Company is also the discoverer of the Henley Harbour CRITICAL REE District in SE Labrador, where the Company controls a belt approximately 12 km long and 2 km wide. This district is 25 km south of the Company’s primary focus, the Port Hope Simpson CRITICAL REE District. This news release contains forward-looking statements that are not historical facts. Forward-looking statements involve risks, uncertainties and other factors that could cause actual results, performance, prospects, and opportunities to differ materially from those expressed or implied by such forward- looking statements. Factors that could cause actual results to differ materially from these forward- looking statements include those risks set out in Search’s public documents filed on SEDAR at www.sedar.com. Although Search believes that the assumptions and factors used in preparing the forward- looking statements are reasonable, undue reliance should not be placed on these statements, which only apply as of the date of this news release, and no assurance can be given that such events will occur in the disclosed time frames or at all. Except where required by law, Search disclaims any intention or obligation to update or revise any forward-looking statement, whether as a result of new information, future events or otherwise.